Maintaining correct running form in the pool will help you maximize the training effects from deep water running. A structured program will yield better results than just jumping in the pool and hoping something will happen. Brennan prefers to use three forms of monitoring training intensity in the pool. You will need a wristwatch or a poolside clock that shows both minutes and seconds. The physiological changes that occur when you are submerged up to your neck in water will cause your heart rate to be from 10-15% lower than for a similar effort on land. You can find your heart rate very easily by touching the large artery in your neck near your Adam’s apple. Count for ten seconds. Multiply by the number six to find your heart rate per minute. Some people prefer to take their pulse at their wrist. Brennan prefers to take the pulse immediately after each interval. Use either the 10 second count method or a heart rate monitor designed for underwater use such as the Polar brand. Another form of monitoring your intensity is counting your cadence. Brennan has you count the number of times your right knee comes forward and up. He likes to take that count the last 30 seconds of each interval. Get your count and double it and that gives you your cycles per minute. It is difficult for you to use your wristwatch for this procedure. You may want to find a clock at poolside or someone close by to call out the time start and stop times for the interval. A subjective scale to measure effort is very useful. It works particularly well if you are used to training on land and have a feel for the cycling rate of your legs and the resulting breathing patterns for each level of exertion. 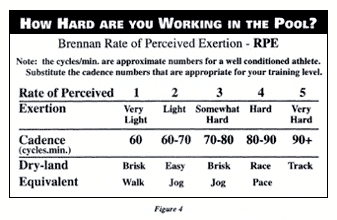 Brennan uses a scale with 5 levels of intensity ranging from very light to very hard (figure 4). Brennan suggests that unconditioned individuals should deduct about 10 cycles/min. or more for each level and that sprinters can often handle a slightly higher cycles/min. (for a shorter duration). Like a brisk walk through the park. This level is a good warm up and warm down. An easy jog. A good pace for active recovery from a hard land training session or competition. This is also a good level at which to start if you are just beginning your cardiovascular program or working on your water running form. A brisk jog. This is the pace at which you would move if you’re just out on a regular training run covering anywhere from three to five miles. This is like running a race pace or your pace during competition in your sport. You should be able to maintain this pace for anywhere between three to 10 minutes or even longer if you are a distance runner. This is an all out sprint and an important level for most sprinters or distance runners attempting to increase their running speed. This is similar to sprinting all out intervals on the track or the wind sprints commonly used in training for other sports. The intervals are short and range from 15 seconds to 2 minutes depending on your speed and your conditioning level.